Dr. DeMichele co-leads the Breast Cancer Research Program of the Abramson Cancer Center and directs the Doris Duke Clinical Research Fellowship Program at Penn. Her research focuses on identifying markers of outcome, response to therapy and development of targeted therapeutics. She is currently the principal investigator of numerous clinical trials and epidemiologic studies and serves as chair of trial operations for the I-SPY2 Trial, a multicenter clinical trial in which targeted therapeutics are tested in the context of molecular and MRI response profiles in patients receiving neoadjuvant therapy for locally-advanced breast cancer. 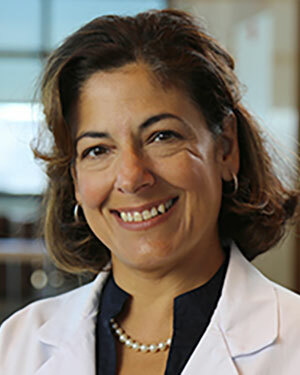 In addition, she directs Penn’s Breast Cancer Survivorship Program, a multidisciplinary clinical research program at the Abramson Cancer Center, where she and her colleagues are performing studies of bone loss, ovarian dysfunction, hot flashes, lymphedema, depression/distress and physical activity in breast cancer survivors. Her work has been funded through the NCI and other charitable foundations. She is a past recipient of a Young Investigator Award from the American Society of Clinical Oncology, a Clinical Research Training Grant from the American Cancer Society and a Patient-Oriented Career Development Award from the National Institutes of Health. Dr. DeMichele has served on the American Board of Internal Medicine Oncology Subspecialty Board and on the editorial board of the Journal of Clinical Oncology. She is currently chair of the medical advisory board of the Expedition Inspiration Fund for Breast Cancer Research. At the Washington University School of Medicine, she was a Four Schools Physician/Scientist Scholar. She received her clinical training in Internal Medicine and Hematology/Oncology at Penn and joined the faculty in 2000 as a breast cancer oncologist and molecular epidemiologist.